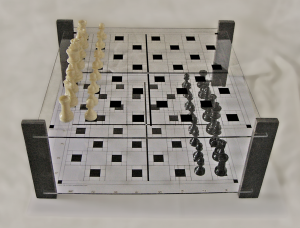 In every page that shows a 3D game of chess or checkers, you will notice that the chess / checker board is mostly clear and is divided into quarters. This allows the person not to be distracted by the board but assist in playing an enjoyable game being able to see all of the pieces and know where the center of the board is on both boards. Each board is 1⁄8th% Black and 7⁄8th% Clear. This guarantees the ability to see the pieces below. black vinyl silk screening for the squares printed on the back. 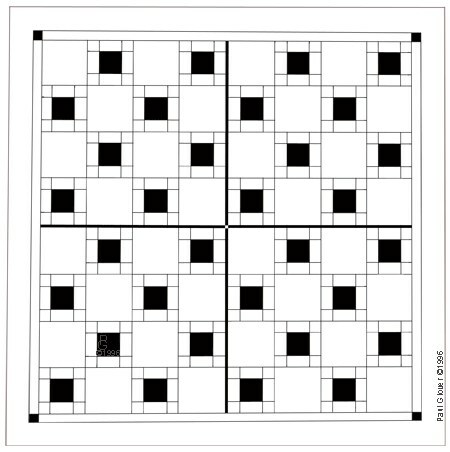 The 8 squares in length and width: 12 and ¾ inches or 320mm. The board is divided up into quarters. Black then sets his pieces up on the other level. This applies to Checkers as well. Watch a game – checkmate in 14 moves. A clear board really enhances the game. You can now truly see all the pieces. 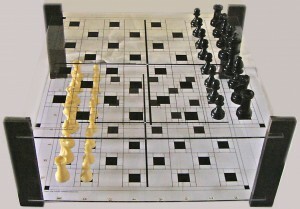 After White has chosen which level (A or B), then Black is then on the other level. Just a quick note: The person playing the bottom has the advantage because that person is now forced to look through the top board (mentally taking note of more possible moves).